AJ MacGinty and John Quill have both made the 31-man squad. MacGinty has been a regular feature since making his debut in July. DUBLINER AJ MACGINTY and Cork native John Quill have been selected to the USA Eagles squad for the Rugby World Cup. Outhalf MacGinty, who made his debut for the side against Samoa earlier this summer, has notched up 54 points in four caps, featuring regularly in their Pacific Nations Cup campaign, as well as the recent warm-up win against Canada in Nepean. MacGinty, who grew up in Dublin and played schools rugby with Blackrock College, before moving to the USA on a work visa, and going on to study and play rugby at Life University in Georgia. Having qualified under residency rules earlier this year, MacGinty was called up to the national side, making his debut in the Pacific Nations Cup back in July. Along with MacGinty, Corkman John Quill has also been included in the final 31-man squad, with the former Munster flanker eligible to play for the country through his mother. 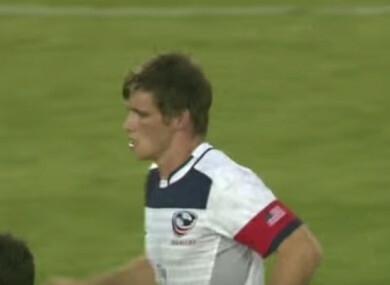 Quill made his debut for the USA in 2012, and has won 13 caps, with the former Irish schools and Dolphin man now based in the US, playing for the New York Athletic Club. As well as the two Irish players, former Irish international Justin Fitzpatrick will be part of the coaching set-up, as forwards coach. Fitzpatrick made his Irish debut in 1998, and the prop went on to win 28 caps, as well as winning a Heineken Cup title with Ulster in 1999. The USA’s inexperienced side are in Pool B for the tournament, alongside South Africa, Samoa, Japan and Scotland, and face the Samoa in their tournament opener in Brighton on September 20. Full squad: Danny Barrett, Chris Baumann, Cameron Dolan, Andrew Durutalo, Zach Fenoglio, Eric Fry, Seamus Kelly, Olive Kilifi, Niku Kruger, Titi Lamositele, Scott LaValla, AJ MacGinty, Samu Manoa, Al McFarland, Matekitonga Moeakiola – Castenet, Takudzwa Ngwenya, Folau Niua, Thretton Palamo, Greg Peterson, Mike Petri, John Quill, Blaine Scully, Hayden Smith, Louis Stanfill, Andrew Suniula, Shalom Suniula, Joseph Taufete’e, Zack Test, Phil Thiel, Brett Thompson, Chris Wyles (Captain). Email “Two Irishmen have been named in USA's squad for the Rugby World Cup”. Feedback on “Two Irishmen have been named in USA's squad for the Rugby World Cup”.